With what some have called the toughest anti-spam legislation in the world expected to finally come into force next year after having been originally passed in December 2010, small businesses should ensure they’re ready for the new regime and familiar with the regulations. Industry Canada is working to ensure your customers will be ready. It has a web site, fightspam.gc.ca, with information for individuals and businesses, including a spam quiz. 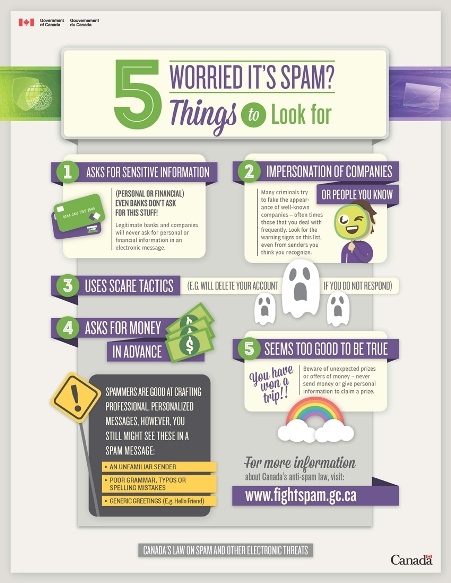 And it has also released an infographic with five tips to help consumers identify a spam message. Can you tell its spam?